First off can we just take a moment to admit that this squirrel is so dang cute! Jill the squirrel is an actual squirrel that even has her own Instagram (@this_girl_is_a_squirrel)! I have painted her before and loved every second of it so I wanted to share with you how to do it! We go over things like how to do white fur, how to create form, and how those finishing details really add so much! I even added a little floral crown for fun, but feel free to add your own accessory or leave it out completely! Brushes and paint tray sold separately. Have you ever wanted to be inspired by painting with us, but weren't willing to make the plunge to get all the supplies? We understand the dilemma. That is why we created the paint kit! So take a deep breath, add the kit to your cart, and give it a try! You won't regret it! Please share your work, tag us @letsgomakeart on Instagram or join our facebook group and show us there or ask questions, we're happy to give feedback or just love you up! 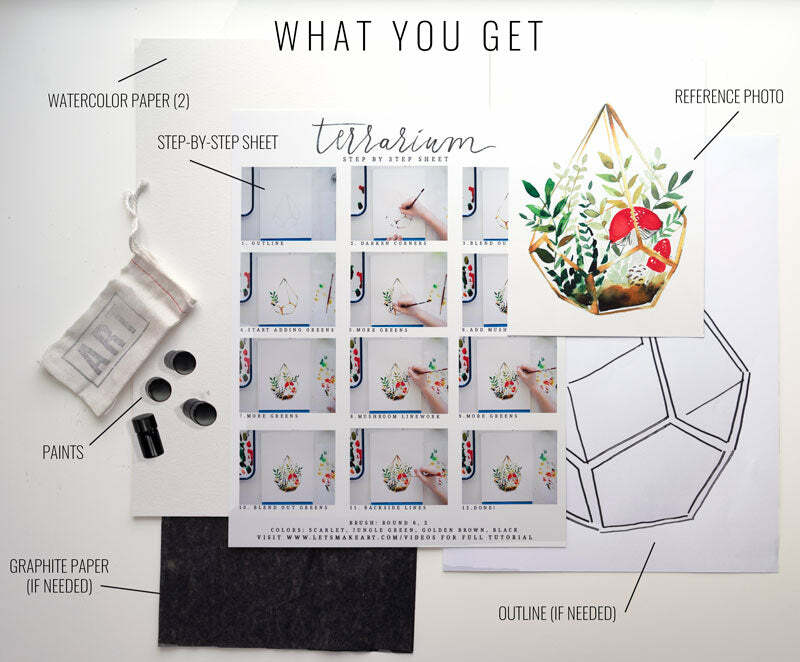 Watercolor subscribers receive a box containing four projects, once a month. Lettering subscribers receive a box containing 12 projects, once every three months! No obligation. Modify or cancel anytime.